So last night was another stunner of an evening, I wasn’t too sure what to make but I have been dying to cook pizza on the BBQ for ages and I finally plucked up the courage to give it a go. Now I just want to say Pizza isn’t that bad for you, if you make it at home, with your own healthy toppings it can be just as healthy as any dinner, and better then ANY pizza you will ever buy. Anyway after a lot of research on the matter of barbequing pizzas the choices boiled down to two major options, one to cook it directly on the grill which had its hazards, and the choice I went with which was to buy a pizza stone. The decision was made easy when I spotted a cute little stone for about 15 euro on sale in a hardware shop. The beauty of cooking on the stone is that you get left with a fantastic crispy and chewy base. It really is simple, you just pop the stone on BBQ for about 45 minutes ahead of cooking and then when it’s nice and hot, you slap on the healthy homemade pizza base and assemble the pizza toppings. In about 6-8 minutes you are left with one of the most delicious healthy pizzas you will ever make at home. The recipe here is totally adaptable in terms of toppings and can easily be made Gluten Free also (you just need to make them a little smaller) and if you can’t get your hands on a pizza stone, you can just as easily cook the pizzas in a nice hot oven for the same amount of time. If you do plan to make these pizza’s they really are great for outdoor parties because you can lay out a selection of toppings and ask them to customise them, themselves. 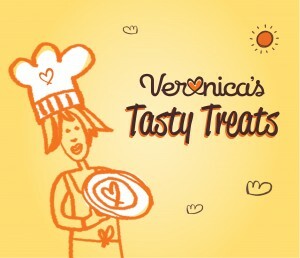 We have even tried some Veronica’s Snacks on them! FUN TIMES! In a large bowl, combine the flour and salt. Whisk together the yeast, water and honey and allow to stand for a few minutes until frothy, then stir through the olive oil. Make a well in the flour and pour in the wet mix. Using your fingertips, slowly bring the flour in from the sides and continue to mix until a rough dough forms. Turn the dough out on a floured work surface and knead for about five minutes. If the dough is too sticky, add a little extra flour until it becomes smooth. Form the dough into a ball and place in an oiled bowl. Cover with a damp tea towel or clingfilm and set aside in a warm spot for about 45 minutes, or until it has doubled in size. Punch the dough down on a lightly floured surface, then knead again for a minute and place back in the bowl to rise for a further 10 minutes. Pre-heat a pizza stone on a hot barbecue for about 30 minutes. Divide the dough into three pieces and roll out into rounds as thinly as possible. Pop one of the bases on the pizza stone and spread the base with tomato sauce, a sprinkling of mozzarella (low fat if your worried), some prosciutto slices and a little pesto. (or whatever else you like on your pizza). Cover with a lid and bake the pizza on the barbecue for about eight minutes or until the cheese turns golden and the crust becomes crisp. Repeat with the remaining dough. Nom Nom Nom! Healthy Homemade BBQ Pizza! 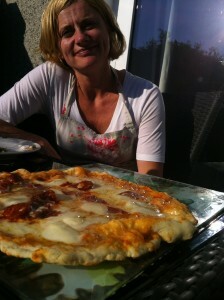 Note: You can now easily buy pizza dough in any supermarket, so there’s no excuse to not give it a go :)!